The CriteriaOne® training course will run April 10-12, 2013. Significant early registration discounts end January 31, 2013. The Certification Course is recommended for consultants, recruiters, and staffing firms who want to develop an additional profit center or increase value to their clients. Success Performance Solutions announced significant early registration discounts will end January 31 for its CriteriaOne® Pre-Employment and Leadership Assessment Training to be held in the Lehigh Valley April 10-12, 2013. Participation is limited to 12 attendees and only 6 vacancies remain according to SPS President Ira S Wolfe. CriteriaOne® is the most reliable and predictable solution to hiring the right people, building the best teams, and keeping your top talent motivated because it links individual competencies directly to business objectives including productivity, profitability, and performance. Using CriteriaOne tools and principles, clients can benchmark the profiles of highly successful employees, evaluate and assess internal and external candidates, and manage the performance of all employees. Developed in the 1990s for small and medium sized businesses by Success Performance Solutions President Ira S Wolfe, human resource and hiring managers can safely comply with hiring and employment guidelines while predictably identifying candidates and employees who have the right competencies (what skills employees need to know), proficiency (how well employees can apply what they know), and motivation (will employees apply what they know) for any job. 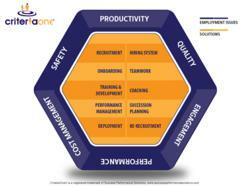 CriteriaOne is a valid, practical and cost-effective turn-key recruitment, selection and retention solution. It is based on the Whole Person Approach to assessing employees recommended by the U.S. Department of Labor. To learn more about CriteriaOne Certification, click here. To register or request more information for the CriteriaOne Certification Training, click here. Success Performance Solutions is an industry leader in the employee assessment and talent management community. As experts in pre-employment and leadership assessment, their CriteriaOne: The Whole Person Approach training workshop will share best hiring practices and techniques for becoming subject matter experts in employee screening and selection. By integrating job required competencies with individual personality, values, and skill factors, hiring managers and consultants will learn how to match, manage and motivate a highly effective workforce.